Nations Press health NEUROLOGISTS ISSUE WARNING: Wearing SKINNY JEANS Is Very Dangerous To Your Health!! NEUROLOGISTS ISSUE WARNING: Wearing SKINNY JEANS Is Very Dangerous To Your Health!! 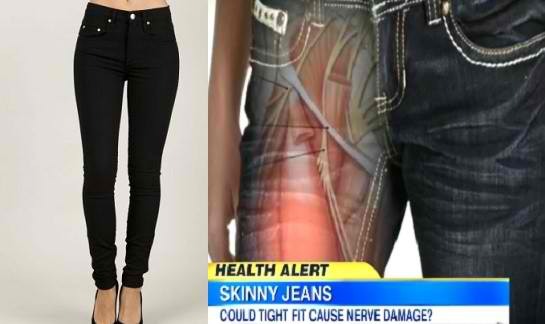 Did you know wearing skinny jeans cause harm in your body? Yes, certainly. women and also men should read this to serve as a warning to minimize and much better to refrain from wearing this kind of jeans. Scientists recently documented a case of a 35-year-old woman whose legs had swelled up so bad — and whose ankles had become so weak as a result — that she couldn’t walk. At the hospital, doctors had to cut off her pants to remove them from her distended legs. Compartment syndrome, a condition that results from increased pressure in a confined body space, like, from wearing skinny jeans. The study, hilariously titled “Fashion victim: rhabdomyolysis and bilateral peroneal and tibial neuropathies as a result of squatting in ‘skinny jeans,'” . At the hospital, the woman told doctors she’d spent the day in a pair of extremely tight pants. She’d reportedly been squatting and emptying cupboards while helping a family member who was moving when she began to feel extreme pain and discomfort. A medical exam revealed signs of nerve and muscle damage in her legs. The injury kept her from being able to walk for days, highlighting the hidden dangers of hipster fashion. “I would certainly say, be cautious about wearing skinny jeans when doing this sort of activity,” study co-author Thomas Kimber, a neurologist at Royal Adelaide Hospital and the University of Adelaide, in Australia, who treated the woman, told Business Insider. So if your plans include squatting for long periods at a time, maybe consider swapping the skinnies for a pair of equally-fashionable leggings. There have been a handful of reports in which wearing tight pants have compressed nerves in the groin and caused numbness in the thigh. But as far as the researchers know, this was the first report that wearing tight jeans caused damage to these particular nerves and muscles.